An observational study is an empiric investigation of effects caused by treatments when randomized experimentation is unethical or infeasible. Observational studies are common in most fields that study the effects of treatments on people, including medicine, economics, epidemiology, education, psychology, political science and sociology. The quality and strength of evidence provided by an observational study is determined largely by its design. Design of Observational Studies is both an introduction to statistical inference in observational studies and a detailed discussion of the principles that guide the design of observational studies. Design of Observational Studies is divided into four parts. Chapters 2, 3, and 5 of Part I cover concisely, in about one hundred pages, many of the ideas discussed in Rosenbaum's Observational Studies (also published by Springer) but in a less technical fashion. Part II discusses the practical aspects of using propensity scores and other tools to create a matched comparison that balances many covariates. Part II includes a chapter on matching in R. In Part III, the concept of design sensitivity is used to appraise the relative ability of competing designs to distinguish treatment effects from biases due to unmeasured covariates. Part IV discusses planning the analysis of an observational study, with particular reference to Sir Ronald Fisher's striking advice for observational studies, "make your theories elaborate." 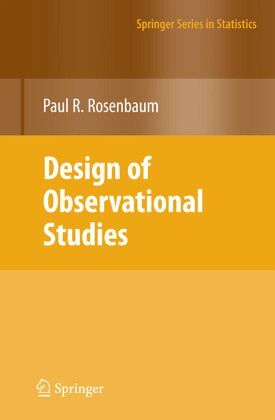 The second edition of his book, Observational Studies , was published by Springer in 2002.